This article will deal with those concepts of 3 phase induction motor which are essential prerequisite for proper selection, procurement, installation and maintenance of the same. Before any actual discussion on motor is started It will better to have a comparison of starting behavior of induction motor and transformer because as per the equivalent circuit representation a 3 phase induction motor is generalized transformer. It is assumed that readers are already familiar with the elementary concept of principle of operation and construction of three phase induction motor. What is the fundamental difference in working principle of induction motor and transformer? That is even though the equivalent circuit of motor and transformer is same rotor of motor rotates where as secondary of transformer do not. 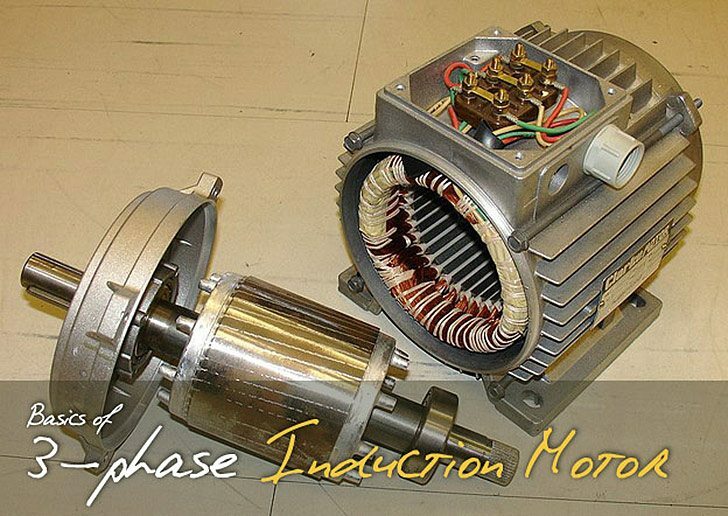 Induction motor is a generalized transformer. Difference is that transformer is an alternating flux machine while induction motor is rotating flux machine. Rotating flux is only possible when 3 phase voltage (or poly phase) which is 120 degree apart in time is applied to a three phase winding (or poly phase winding) 120 degree apart in space then a three phase rotating magnetic flux is produced whose magnitude is constant but direction keeps changing. In transformer the flux produced is time alternating and not rotating. There is no air gap between primary and secondary of transformer where as there is a distinct air gap between stator and rotor of motor which gives mechanical movability to motor. Because of higher reluctance ( or low permeability) of air gap the magnetizing current required in motor is 25-40% of rated current of motor where as in transformer it is only 2 -5 % of rated primary current. In an alternating flux machine frequency of induced EMF in primary and secondary side is same where as frequency of rotor EMF depends on slip. During starting when S = 1 the frequency of induced EMF in rotor and stator is same but after loading it is not. Other difference is that the secondary winding and core is mounted on a shaft set in bearings free to rotate and hence the name rotor. If at all secondary of a transformer is mounted on shaft set at bearings the rate of cutting of mutual magnetic flux with secondary circuit would be different from primary and their frequency would be different. The induced EMF would not be in proportion to number of turns ratio but product of turn ratio and frequency. The ratio of primary frequency to the secondary frequency is called slip. 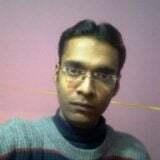 Any current carrying conductor if placed in magnetic field experience a force so rotor conductor experience a torque and as per Lenz’s Law the direction of motion is such that it tries to oppose the change which has caused so it starts chasing the field. Why LT motors are delta connected and HT motors are star connected? In star, phase current is same as line current. But phase voltage is 1/1.732 times line voltage. So insulation required in case of HT motor is less. Also as current is less copper (Cu) required for winding will be less. LT motors are delta connected. Insulation will not be problem as voltage level is less. Starting current will not be problem as starting power in all will be less. So no problem of voltage dips. Starting torque should be large, as motors are of small capacity. LT motors have winding delta connected. 1. In case it is having star delta starter than they are started as Star connected motor. 2. After it attains 80% of synch speed the changeover takes place from star to original configuration delta. 3. In star the voltages across the windings are lesser that is 1/1.732 times that available in delta so current is limited. 4. When it goes to delta again voltage is full line voltage so current increase even though it is lesser than the line current it remains higher than the line current drawn in star connection at reduced voltage. So cables for motor are sized for this current that is what it draws in delta connection. What happens if we use silicon steel core in induction motor for path of flux instead of air gap? I want to know how we can defined the turn ration between the primary and secondary in induction motors. for example we have a 37W/50 hp motor so what will be starting current consumption for this motor and motor is connected in star delta configuration. i m confused it will be six times or 3 times of the rated current. There’s a slight misunderstanding in your explanation on the reason for Star and Delta connections. In fact the reason we use Star connection on higher voltage machines is to drop the Volts per pole. The motor performance doesn’t need to change at all because the turns per coil and conductor sizes are changed to suit the changed phase volts. Star connection reduces the volts per phase, so in design, the turns are reduced proportionately and the conductor size increased proportionately. That means the flux density in the iron remains the same, so shaft torque and starting curve is the same. There is no real commercial advantage either. There is the same total amount of copper in the slot. Could you please explain/ draw how to connect a three pole two way with off rotary switch to a three phase motor in order to obtain two speeds with off between. Can you please explain Steinmetz equivalent circuit of induction motor, mainly the relationship between frequency of supply and equivalent resistance across the rotor side?? If there any book or material in which mpm, cpm , rpm equations for induction motors used in automation industry are given? in our site we are having a ht induction motor .in that there are two terminal boxes one is for 6.6kv supply connected in star and other is 3.3kv supply terminal box connected in delta ,,how in one winding there are two connections ? and do we need to change star connection if we use delta? Sir I think starting c/n of 3 phase induction motor around 1.5 times full load current..
Sir my question is , is it necessary for the rotor and stator to have same number of poles in order to run? just 1st how many pole each rotor and stator. but, i think stator have pole & do’t rotor. urrent in on the primary. Current in on the tertiary. What does the secondary do? Current on primary; motion on secondary. What happens to the tertiary? Someone must have put two currents in (1&3). What happens? When IM starts we have high inrush current, but how this current comes to normal value when motor works at or around rated speed? And is their any difference between full load current and name plate rated current? could you tell me, magnetizing current is higher in transformer or in induction motor ? magnetizing current is lower in a transformer, and its a lot lower. In transformers, magnetizing currents its about 4% of the nominal current, but… In induction motors its about 30%. This difference is because the high reluxtance value, just like the autor said in the paper. TO Ahmedelwake: I think magnetizing current is less in case of transformers because they do not have an air-gap unlike induction motors! Why induction motor draws 6-7 times of full load current during starting using DOL? During starting speed of motor is zero and hence slip is unity. So magnitude of rotor induced EMF is very large at start. As rotor conductors are short-circuited, the large induced EMF circulates very high current through rotor at start.The condition is exactly similar to transformer secondary short-circuited and excited by rated voltage. The current through shorted secondary is very large so primary also draws a very high current. Similarly in induction motor when there is high current in rotor stator also draws high current from supply. A good post, but you should define LT and HT in the 2nd half of the article. I assume you mean Low Torque and High Torque, but it is unclear. Stator rest on motor frame, after air gap there is rotor which is mounted on shaft and shaft rests on bearing and bearing in turn rest on frame. Rotor voltage at any speed (running condition) = Slip times the rotor stand still voltage. During stand still condition voltage induced in rotor = (Stator induced EMF -stator losses) x turn ratio of winding x distribution factor x pitch factor of winding. Voltage is induced in rotor as per above mentioned expressions. Since during running condition rotor voltage is very small that is slip (1-2%) times the stand still stator voltage hence rotor voltage and consequently the shaft voltage is negligible. Only in standstill (slip being 1 during stand still) condition this voltage is of concern. This can be prevented by grounding one of the bearings to prevent the leakages. The bearing insulation is thus determined by the manufacturer while checking the shaft voltage at the works. This forms a routine in-house test for all HT and large LT motors. To detect shaft currents, the normal procedure of leading manufacturers is to measure the shaft voltage end to end, with a full voltage applied to the motor terminals. In addition to my previous reply please note that rotor core are laminated with insulated sheets so voltage induced in rotor can get induced in shaft as both are in contact but only a very small amount of rotor voltage gets induced in shaft that is as good as leakage voltage.